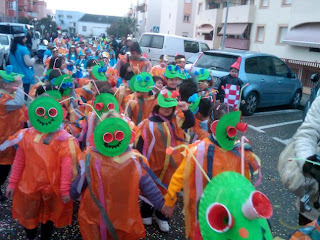 ECO ARTS AND CRAFTS IN PRIMARY SCHOOL: FEBRUARY Carnival and Green Alien masks. FEBRUARY Carnival and Green Alien masks. We made a carnival mask with paper plates and plastic glasses. This year the topic at school is Galileo Galilei 'the space' so we decided to be aliens. Peace day and Eco arts!